Some quote this as the fight of the year! Ha maybe in the toy world but we call it the fight of the plastic, no pay per view here just some retro style plastic! 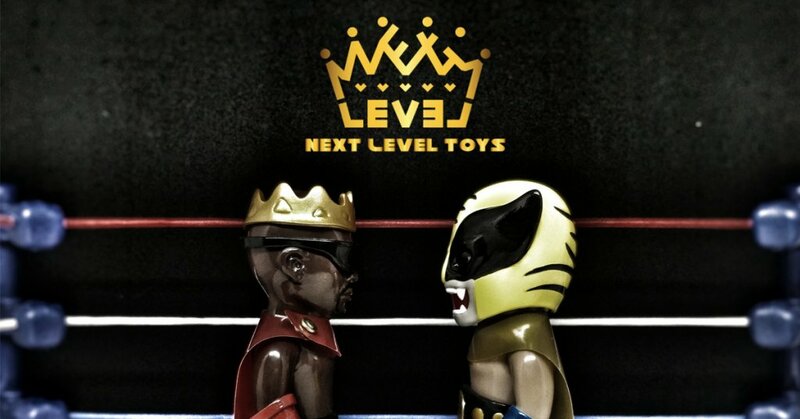 Next Level Toys presents to you “Fight Of The Century” Set! Next Level Toys is a new designer toy brand established in HK in 2017. It aims to create outstanding toy collectables under a brand new frame, so as to bring a new playable concept to the toy collectors. This product is called The Great Martial Artist Series – Fight of The Century Set. It is a combination of boxer and wrestler, designed with the concept of the battle between the sharpest spear against the strongest shield. This set contains two boxer figures and several wearable accessories, including crown, glasses, boxing gloves, champion belt and cloaks. Multi-playing options will give you a fantastic feeling when you hold it in your hand. Don’t judge them by hight or weight these two looneys pack a punch! The only retailer announced right now by Next Level Toys is our boys at Vintage & Vinyl Club 膠易廣場 on December 2nd at http://vvc.bigcartel.com/products. No mention of price and limited amount. Stay tuned for further info. Find Next Level Toys on Facebook and Instagram.